February 15, 2019 9 a.m. – 12 p.m. Through this event, Nazareth MSA hopes to provide the opportunity for students, faculty, and staff to gain first-hand experience with the hijab (women’s head scarf) and and Kufis (men’s head covering) as we explain the purpose, responsibilities, and expectations associated with it. Please join us in wearing a hijab on Friday, February 15th, and then for a reflection at 4:30PM in the Sulam Center, located in George Hall across from Colies. 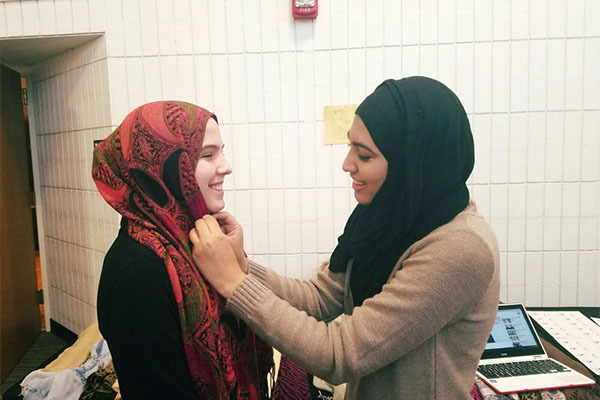 MSA leaders will be lending hijabs and Kufis to students, faculty and staff who are interested in participating in this experience. Distribution will be from 9:00AM to 12:00PM near the info desk in Shults. You can bring your own scarf and learn how to wear it as a hijab - or you can choose from a variety of hijabs and Kufis that MSA will loan out for the day (while supplies last)!